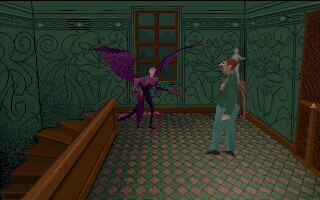 Alone in the Dark is a very creepy and scary game. Its story and theme are based on the works of H.P. Lovecraft. The introduction sets the atmosphere perfectly, and it builds up consistently throughout the game. The story takes place in a haunted house. A certain Jeremy Hartwood died there (possibly through suicide), and it will be your task to investigate what really happened. You will be given a choice between two characters to control throughout the game: Emily Hartwood, who is Jeremy's niece, or Edward Carnby, a private detective. The storyline will not depend on the character of your choice, and their features are equal so it doesn't really matter which one you choose. You will start your adventure in the attic, because you have reason to believe that an important clue has been hidden in an old piano there. This game combines elements of both adventure and arcade. The minute you start, monsters will start waking up throughout the house and will be coming after you. Depending on the difficulty setting, there will be more or less of them, but an infinite number in either case. This means you will have to play quickly. You won't be able to afford the time to stop and think about what to do next. At the beginning, you will only have your arms and legs for fighting, but as you progress, you will also find guns and swords to fight with. While defending yourself from the monsters, you will also have to complete your original task - solving the murder mystery. You can probably guess that this game is non-stop action for both your fingers and your brain. But it doesn't just end with excellent story and gameplay. 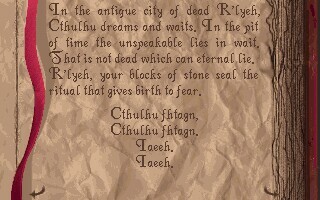 This was also one of the first games to offer three-dimensional graphics that run smoothly even on 386-class machines. This was made possible by combining beautiful static backgrounds with polygonal characters. 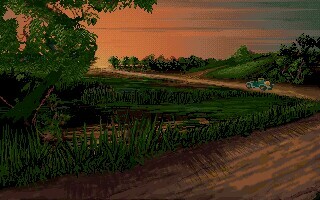 It's a compromise that had to be made, but the overall result was breathtaking back in 1992 when the game was published. I would like to finish the review here, but it does not end with a brilliant graphics engine either! The game's sounds are great mood setters and will probably cause goose bumps every now and then. Enough said; if you are not convinced by now, you'll never be. 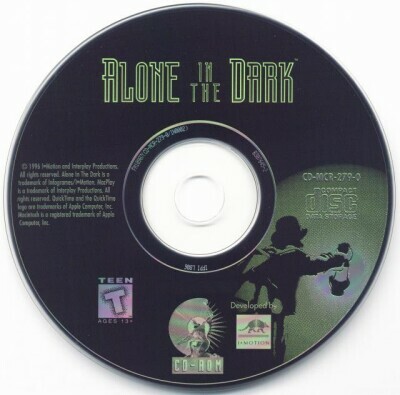 Alone in the Dark was one of the best games ever made for the horror adventure genre. Period.